So the elections came and went. As expected, ‘Mutti’ won. It wasn’t the fact that she won that was surprising. It was the style. So emphatic was her win that the competition was left speechless. For a big part of the evening, we sat glued in front of the screen, wondering whether she’d reach the magic number-absolute majority. I felt sorry for the opposition. There is losing, and then there is losing. The latter is the kind of stuff you wouldn’t wish on your worst enemy. She had crushed them, literally. The social democrats managed a measly 25.7 %. Their natural partners the Greens managed 8.4%. Frau Merkel’s former coalition partners FDP (liberals) didn’t even manage the minimum 5%, and have as a result been kicked out of parliament. It was an evening that many will live to remember. But if the opposition had any regrets about how they conducted their campaigns, I didn’t see it. It was more like sighs and yes, helpless shrugging of shoulders. ‘How were we to have any chance against her?’ The social democrats seemed to be asking themselves. Amazingly, there was no trace of bitterness. And so for the rest of the evening, we were treated to a chorus. “We would like to congratulate Frau Merkel on her victory.” One opposition leader after the other went on. 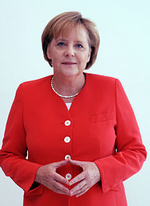 Frau Merkel on her part smiled that distant smile, which never quite reaches the eyes. Not once did she let the moment consume her. Not once did she gawk down at the losers in the way lesser mortals would have been tempted to do. I watched this spectacle with a mixture of emotions. The lack of drama was both puzzling and admirable. No one acted like their lives depended on the elections. No one acted as if the world would crumble if the opponent won. But most important of all, no one doubted the ACCURACY of the results. It was a near opposite of elections, as I remember them back home in Kenya.